Labor Day weekend signals that fall TV will be here shortly, but there are still a few weeks before the bulk of shows start their seasons. In that time, you can do a last minute binge or two, and this article explains why The Good Place should be one of those last summer binges. Last year around this time, most of us ratings followers weren't very optimistic about The Good Place's chances. High-concept comedies rarely work, and NBC has been struggling in general in the comedy department. Despite this, The Good Place was easily NBC's most successful new comedy of the season, and I honestly believe that a lot of why it worked is because of how good of a show it is. From Parks and Recreation creator Michael Schur, this fast-paced and heavily serialized comedy follows a woman who ends up in a heaven-like afterlife but isn't supposed to be there. The 13 episodes of the first season take this concept in surprising directions, and left fans in a desperate wait for the second season, which premieres on Wednesday, September 20th at 10:00 with two new episodes, and then airs Thursdays at 8:30 beginning on September 28th. 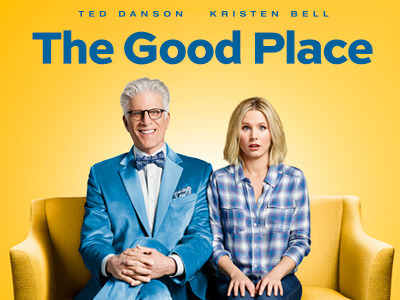 The series begins with Eleanor Shellstrop (played by Kristen Bell) waking up in the Good Place, and being informed by the neighborhood's architect Michael (played by Ted Danson) that she ended up here because of how good of a person she was. Eleanor quickly realizes that a mistake has been made, as many of the details about her life are incorrect, and she really wasn't a good person. The series follows Eleanor trying to fit into the Good Place, often by trying to actually be a good person. While the second episode makes it seem like the series will follow Eleanor learning a little bit each week how to be a good person, the show quickly proves that this is not the case, as the story moves along quicker than at least I expected it to. The style of comedy in the show is comparable to Schur's Parks and Recreation, as well as other NBC comedies, such as Superstore. The storytelling is similar to Lost, with flashbacks focusing on the pasts of the different characters in the show, and surprising twists (the season finale has a particularly surprising twist). So, I would describe the series as Parks and Recreation meets Lost, and as weird as that may sound, it turns out wonderful, thanks to the excellent work of those behind the scenes and on screen. There are six main characters in The Good Place. The protagonist is Eleanor, who we see was a pretty terrible person on Earth, then there is Michael, the neighborhood's architect, who is excited and nervous about this, his first project. Eleanor's supposed soulmate is Chidi, an ethics professor who struggles to make decisions. Living next door to Eleanor and Chidi are Tahani and Jianyu. Tahani was wealthy and is cheerful, but Eleanor finds her to be condescending, and Jianyu, a Buddhist monk who has taken a vow of silence, which he chooses to continue to observe in the afterlife. Finally, there's Janet, who is essentially the Good Place's Google, providing the residents with information. With just 13 half-hour episodes, The Good Place shouldn't take very long to watch. There's no skipping around in this show, as skipping an episode would mean missing important story elements, but it won't take long and shouldn't bore anyone. If you like NBC comedy humor and heavily serialized storytelling, The Good Place is definitely for you. If you've seen The Good Place already, do you have anything to add? If you haven't, do you plan on giving it a shot? Leave your thoughts in the comments!